This was my first time in Barcelona and the Runner Bean Tour with Ann Marie was one of the highlights of our trip.Ann Marie was so knowledgeble about the city and so eager to share. Her love of the amazing architecture was infectious and we wouldn't have had such a fabulous time there without all of her tips on where to go.It was so great to be shown how to use the metro and so we were able to find many more great places based on her advice. Ann Marie will be so happy to know that she helped make your trip wonderful. Hope to see you in Barcelona again! Thanks for joining us and many thanks for taking the time to write the review. As a small company, it's great way for others to get to know more about us. All the best to you! We enjoyed our Runner Bean tour with Gorka in the Bari Gotic area of Barcelona. It was easy to make the reservations before our trip. There were several people waiting to join the tours without reservations. If you have a reservation, be on time. They will fill the tours with people who do not have a reservation. Some people with a reservation tried to join late and they were turned away because the tour was full. We learned a lot on the tour and would recommend them. They were very professional. Remember to tip because there is no fee for the tour. Thanks a million for the review. Gorka will be pleased! We've tried free walking tours in 3 cities in Europe and this company was pretty good. They operate everyday at 11am in Winter which is great as it means you don't have to get up extra early and the tour takes 2.5 hours and ends at lunch so by then we're ready to eat. 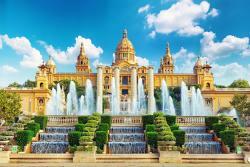 Not knowing much about Barcelona we decided to do the Gaudi and book the Old City Walking tour. Since we didn't have a booking for the Gaudi tour, we turned up 25 mins early and got a number. The tour doesn't start till 11:05am so we got breakfast and coffee. Our tour guide was Jessi who was energetic, easy to understand and personable. She always found a moment to talk to individual groups to find out more about them. Jessi was humorous and was patient when teaching people how to use the Metro. What I also liked was that she was always willing to take our photos if we wanted and it was fascinating to learn about the complex mind of Gaudi. Afterwards, Jessi showed us a nice and cheap family run cafe near the Sagrada Familia that ended up costing 7 euros each for lunch and included a meal, drink and coffee. Oh and the sites visited included Batllo and Sagrada Familia and 2 others, well done Jessi! Two days later we came back for the Old City tour and to be honest it wasn't our cup of tea. The sites visited had history attached but there didn't seem to be any sequence or flow. We visited more sites than the Gaudi tour and didn't have to take the train but it seemed like in a few places we were just standing around to take up some time. People had finished looking and taking photos but we were still milling around. Go if you like Gothic themes then go but I didn't get much out of it as the Gaudi tour. So in the end, put on walking shoes and give this one a go. The guides worked on tips and of course we did but there was no pressure; tip what you think it was worth. Jessie was our guide and she was knowledgeable and interesting. She made sure that the group was together and that no one got lost. Even though we did not enter the buildings, she had pictures and created a captivating story for all of us. Tomorrow my friend and I will do the Gothic Tour. This was my first "free" tour and I will continue to attend these. Truly a comfortable and wonderful way to learn about a city and their special architecture. Thank you for your time Jessie. We´re glad that your first tour was a great success. Jessi will be pleased. Looking forward to seeing you on the Old City tour! Many thanks. We took two great tours with this group, the old city tour and the gaudi tour. The old city tour was led by a sassy Irish lass by the name of Catherine who we were skeptical of at first because what do the Irish know about Spain. Well our fears were put to rest as she walked us around and taught us the history of this amazing town. She was able to gather up some actors in the group and use them to paint a picture of Catalonian history. We learned everything that makes Barcelona unique while having fun. She was also able to point us in the direction of a great place to get a Guinness at the end of the tour. The second day we followed Jessica through the city to see the gaudi buildings. Going through the metro can be scary as a group but with some tips from Jess she took the group under her wing and safely guided us through the metro past the pick pockets and safely to the next piece of history. At the end of the tour Jess told us her dad was an architect and that is where much of her scholarly knowledge comes from, to be honest I was hoping she would say her grandfather was gaudi and her name was Jess gaudi, I would have believed it with her ability to knock down questions thrown at her from all angles. We loved these tours and would do them again. Wow! Catherine and Jessi will be thrilled to read your review. We will surely pass it on to them and many thanks for taking the time to share your enthusiasm for both tours!